While my Etsy shop is mainly ready-to-ship (RTS) items, I also have some custom items available. One favorite listing is "The Messy Baby" gift set. Perfect for a new mama-to-be (or daddy-to-be! ), to prep for YOUR little one's arrival, as a new grandparent gift (have some of the essentials at Grandma & Grandpa's house for visits!) - or just because! 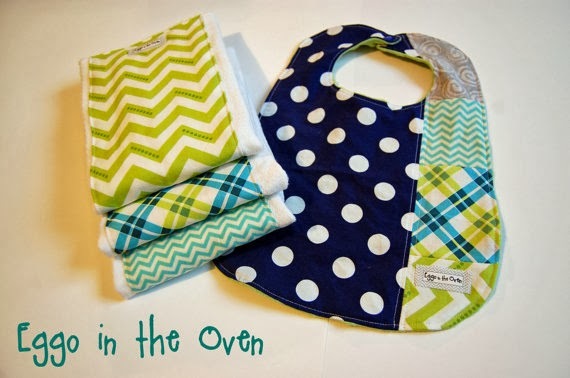 This set is comprised of three burp cloths and an over-sized patchwork bib. Made in the color scheme of your choice - or to match your favorite in-stock fabric. Hope you have a WONDERFUL weekend - lots of sewing and family time planned here!